"Delicious bar cookies. Who can stop at one?" Preheat oven to 350 degrees F (175 degrees C). Lightly grease one 9 inch square baking pan. Combine flour and baking powder and set aside. In a large, clean glass or metal bowl, whip egg whites and salt and until foamy. Gradually add sugar and continue to whip until stiff (but not dry). 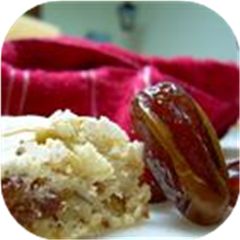 Gradually fold in dry ingredients then fold in dates and nuts. Spread evenly in prepared pan. Bake for 20-30 minutes or until firm to touch. Cool in pan until just cool enough to handle. Cut into finger-sized lengths and roll between palms to form logs. Roll each log in confectioners' sugar. Cool completely on wire rack.